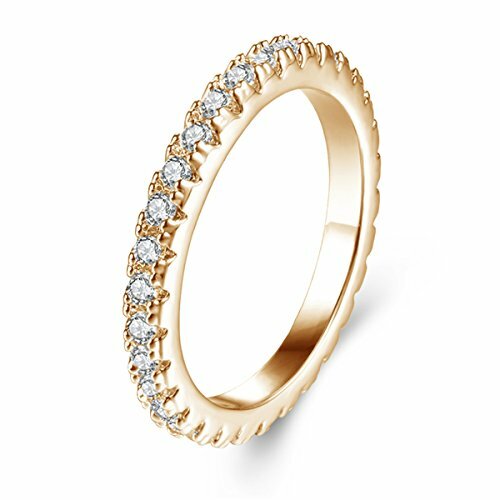 Material:Main Stone is White AAA Grade Cubic Zirconia CZ Diamond.Plated with Champagne Gold.Each stone is hand set by artisans who have a minimum of three years of experience.100% High Quality. Ring Width:0.1 inch.Weight: 2.07g (10.4ct)/pc. ❤Material:Main Stone is White AAA Grade Cubic Zirconia CZ Diamond.Plated with Champagne Gold.Unlike the dead light of rhinestones, Zirconias sparkle like real diamonds and reflect rainbow gloss in sunshine.Each stone is hand set by artisans who have a minimum of three years of experience.100% High Quality. ❤Ring Width:0.1 inch. Weight:2.07g (10.4ct)/pc.It use environment friendly brass(CADMIUM FREE and NICKEL FREE). 3 times finish by human hand, smooth and mirror polishing on outside metal surface. ❤Occasions:Wedding,Engagement,Party,Events,Anniversary day ,Valentine's Day,Mother 's Day,Birthday,Thanksgiving Day,Christmas Day. ❤This Rings for Ladies promises a carefree and comfortable wear. It's design is meant to accentuate the fingers beautifully. If you have any questions about this product by Jiangyue, contact us by completing and submitting the form below. If you are looking for a specif part number, please include it with your message.